How do I edit chart data in a Power Presentation? How to update a chart in PowerPoint to show your data. 1. 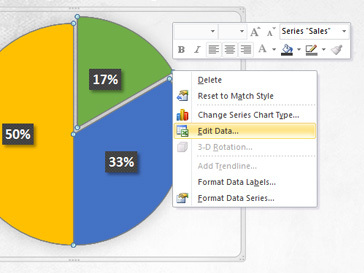 Right-click on a chart or graph in PowerPoint (on a Mac, CTRL+Click) to show the options menu. 2. Click on "Edit Data..."
3. Excel will open and show the data in a spreadsheet. enter in your data here and close excel when you are finished. 4. The PowerPoint chart will automatically update to show the new values.